a thoughtful blog: I shall not live in vain . . . 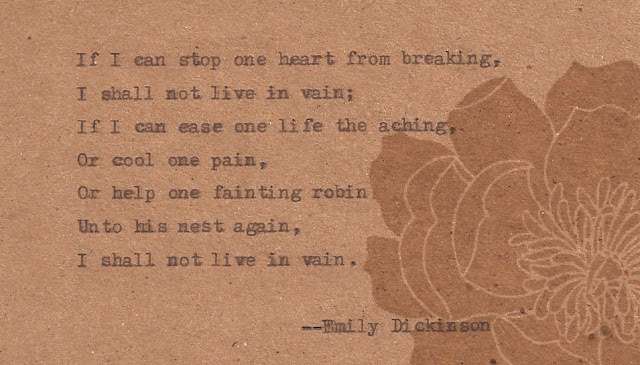 I shall not live in vain . . .
"I shall not live in vain." Lately I feel like my eyes have been opened more than ever to the needs that exist all around me--in my city, in my neighborhood, in my extended and immediate family . . . physical needs, emotional needs, spiritual needs. I know that in and of myself I cannot meet all of these needs. My personality is the type that always wants to try, though. "I am here for you! / Thinking of you! / Praying for you!" And I truly mean it! But when the needs are too great for me to bear or I end up not being there for someone, I become overwhelmed and sorrowful. One of my greatest fears is failing someone. But I have to remember--I am not the one that people need (and I will fail). God is the one that people need (and he never will)! I just need to point the way to Him. 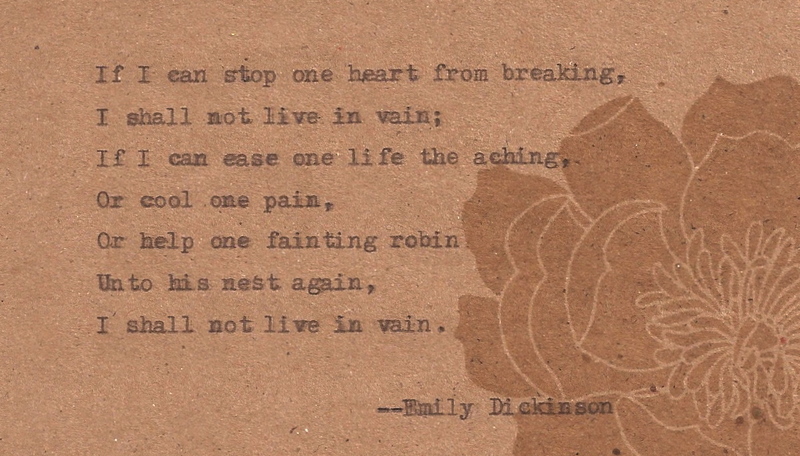 I just couldn't post the poem without sharing all the thoughts swirling around it in my head. I think it is achingly beautiful. I would love to hear--what's been on your mind lately? Amber if anyone lives this out it is you. Your note that you sent shortly after Savannah was born during a time I felt so overwhelmed, the meals you sent after my babies were born, listening when I needed to vent about my own miscarriage knowing you really understood, and hosting my daughter's first birthday at your house even when it was invaded by tiny ladybugs. I am so grateful for your friendship and heart, especially during a time I felt alone and far away from family. So know that you make a difference. Thank YOU! Thank you, Sara. That means so much! I am glad I could be a friend. And Savannah's birthday party was so fun--that is a good memory. :) Hugs! !